In "The War on Grafelnik," both Zorn and Edie (Zorn's ex) want to spend the holiday with their son, Alan. This year, December 25th is both Christmas and Grafelnik, a holiday built around themes of vengeance. Taking an accidental cue from Edie's new fiance, Craig, Alan tries to play his parents off against each other in order to get the best gifts possible (a competition Zorn ultimately wins by getting him a hovering vehicle with a laser mounted to the front). When they realize they've been manipulated, Zorn and Edie team up to teach Alan a lesson, and they nearly destroy a mall in the process. It's a fun episode, mainly thanks to the series's willingness to commit to its premise. There's no question the writers and producers are familiar with the source material - the vehicles, creatures, weapons, and terms relating to Zorn's home all look and sound like they emerged from an animated series from the 80's. In addition, the live-action characters, while somewhat absurd, are developed enough to avoid the obvious pitfall: this is a comedy, but it doesn't devolve into slapstick. The holiday elements are fairly straightforward. This is, at its core, an episode about split families at the holidays and the conflicting expectations and traditions that can cause tension. Decorating the severed head of a giant makes for a nice variation. 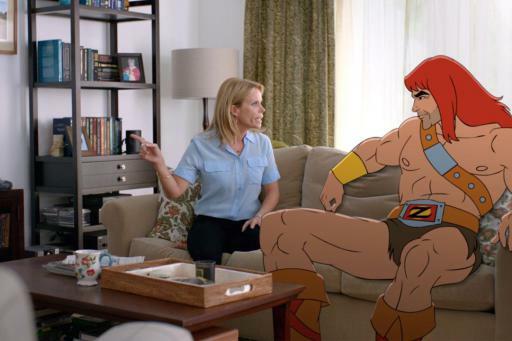 The "War on Grafelnik" was the first episode of Son of Zorn I saw, but I've since gone back and watched the first two to get a little more context. I liked those better, though I suspect the holiday episode would be even better when seen in order. I'm tentatively planning on watching more if I get time - at 30 minutes each, these don't overstay their welcome, and I enjoy the contrast of styles. My advice is not to start in the middle - give the pilot a chance if the premise sounds interesting and see what you think. It's definitely not for everyone, but I'm enjoying it quite a bit.